If someone told me the creative minds behind Robocop (1987) had opened a time portal and put together their screenplay from future headlines, I think I’d pause for a second before calling the loony bin. Paul Verhoeven’s classic sci-fi satire tells of a world in which power-hungry multinationals control our government, indiscriminate drones are being developed for warfare, major metropolitan areas are privatising law enforcement, newscasters smile and banter while announcing the destruction of our ecosystem, and the once thriving city of Detroit has collapsed under the weight of all this corruption. 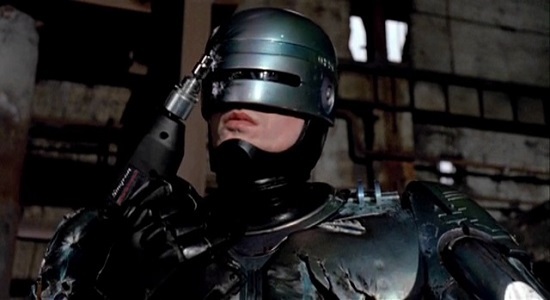 All we’re missing today is a heroic cop named Murphy (Peter Weller) and a program to turn his mangled corpse into a cybernetic crime-stopping machine. The irony lies in that the filmmakers were never all that concerned with the twenty-first century. Verhoeven and his screenwriters, Michael Miner and Edward Neumeier, wanted to poke fun at the perversions of their own time, the “go big or go broke” eighties, and, in so doing, stumbled on a fundamental truth about post-industrial humanity: we as a mass make for an absurd, self-destructive species. Meanwhile, Frank Miller, the writer who’d next claim the Robocop concept (and forever be denied), just saw a gritty action flick. We’ll get to him in a bit. The first Robocop was well received by the critical community, owing to the latter largely consisting of unabashed liberals eager to chastise corporate America. 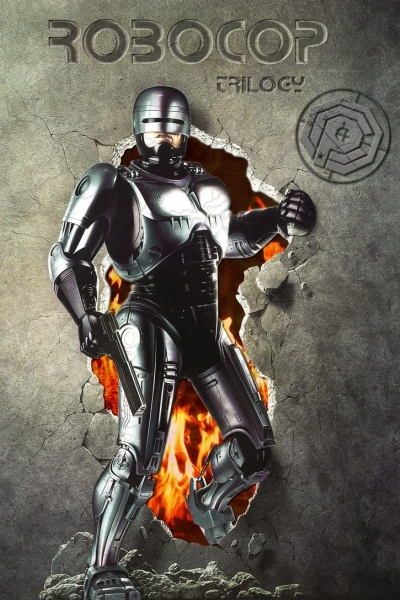 When the franchise turned its satirical eye toward political correctness and the war on drugs, those same critics cried bloody murder, accusing Robocop 2 (1990) of the very sins it was denouncing. I, for one, find Irvin Kershner’s sequel as astute as the original and perhaps even as prophetic. We’ve got a widening income gap, children being handed firearms by the same caretakers bemoaning the absence of good role models, and narcotics laws that make victims of everyone, save for the rich. Mind you, Robocop 2 is perhaps too slick for its own good, lacking the earnestness of Verhoeven’s outlandish excesses. The bigwigs at Orion Pictures would have disagreed, concluding instead that the series needed less teeth and more formula. Cue Fred Dekker’s Robocop 3 (1993), the only entry to credit Frank Miller as an actual screenwriter. In lieu of social commentary, the movie offers up offensive Japanese stereotypes (including but not limited to robot ninjas), chronic misogyny, mutant punks, rabid mercenaries, and working-class outlaws standing their ground. If I lived in Sin City (2005), I might’ve found this stuff terribly pertinent. The Robocop franchise also spawned a bunch of television series, including two Saturday morning cartoons. The first, aptly called Robocop: The Animated Series, is pretty much what you’d expect from a kids’ show broadcast before Muppet Babies. It lasted only twelve episodes but has the virtue of not having featured extreme pocket parachutes, extreme fishnet cannons, and extreme retractable roller skates. The same cannot be said of its late nineties successor, Robocop: Alpha Commando. One could easily conclude that TV is the wrong medium for Robocop or that our mechanical hero belongs strictly in the eighties. Certainly, the Canadian live-action drama Robocop: The Series seemed to be missing that edgy je ne sais quoi, though it turned out an entertaining show in its own right. Then came Robocop: Prime Directives to change our perception. Also produced in Canada, the 2001 mini-series centered on Omni Consumer Products’ efforts to duplicate the Robocop experiment with Murphy’s former mentor. Greedy conspiracies and sociopolitical pot-shots abound as the two cyborgs try to make sense of their new reality, demonstrating how much the franchise still has to offer even in the new millennium. For this reason, I find myself more charitable towards José Padilha’s remake than most critics. Certainly, this new Robocop (2014) does feel at times like a few too many studio execs barged into the kitchen with their magic bland sauce. However, the film does dish out some good satirical insight, such as the idea that news pundits have replaced TV commercials as our primary source of misinformation, and Murphy himself remains full of promise as the incorruptible, cybernetic lens through which filmmakers can expose our most shameful excesses. To me, that’s the most important thing. I mean, how many eighties blockbuster properties can claim to speak to us today as well, if not better, as when they first came out?